A coach company at the centre of a security alert on the M6 Toll motorway has praised the actions of its driver. Armed police stopped the vehicle in Staffordshire on Thursday morning after vapour from a passenger's fake cigarette was reported as suspicious. Police told the driver to pull over and closed the road for more than four hours while they investigated. 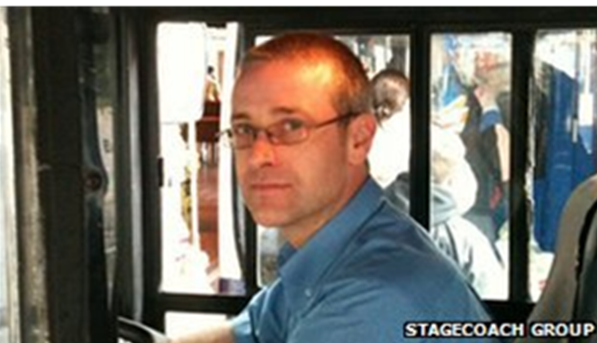 Megabus said the driver, David Myerscough, 38, of Preston, had behaved in a "calm and professional" manner. Armed officers, troops, firefighters and bomb disposal experts were all called to the scene at Weeford, near Lichfield. Megabus said a passenger had contacted police about the incident. Staffordshire Police said they had received a "genuine report" of vapour escaping from a bag while the coach was near the M6 Toll plaza. The coach firm said police instructed Mr Myerscough to go through the toll and pull over on to the hard shoulder. Mr Myerscough said: "Once we pulled over, the police told me to make sure nobody left the bus under any circumstances. "After a while, we realised that the road beside us had actually been closed and cars had stopped going past us. "Then we saw the armed response team arrive. "Just before that, a few passengers had started to get a bit agitated, but when they saw what was happening they calmed down and realised that we were going to have to go with it. "I was instructed to take the passengers off the bus one by one. "I had to wait at the front of the bus until the armed police gave me the signal to bring the next passenger off, and I was to tell them not to put their hands in their pockets and just to walk out slowly." Forty-eight passengers on the Preston to London service were led off the coach and forced to sit apart in a cordon on the opposite carriageway. Mr Myerscough added: "Once we were all off the bus we sat on the Tarmac and nobody was allowed to use their phones." One of the passengers said police had acted in the manner in which he would expect following the limited information that was reported to them. Andy Gray, who was travelling on the bus with his girlfriend, said: "Arguably the fault lies with the passenger because they over-reacted and called the police instead of telling the driver. "My only complaint would be the lack of information. It wasn't until we looked at the BBC website when on the other coach that we found out that it had been caused by a fake cigarette." Staffordshire Police said they acted after receiving a report from a "genuinely concerned member of the public about suspicious activity". Ian Laing, general manager of Megabus, said safety and security were the top priorities. He said: "While it later emerged it was a false alarm, we can understand how everyone on the coach must have felt when events were unfolding at the time. "David followed all of our procedures correctly and kept a calm head, as did the passengers on board."